Since we can source a maximum of 20mA per pin for PORTB and total maximum source current of PORTB is 100mA, hence we can use PORTB to drive LED display directly. As shown in the circuit, 2 common cathode 7-segment LEDs are connected to PORTB with 120 Ohms current limit- ing resistor. Each segment of two LED are tied in parallel to P1. Q1 and Q2 are activated by logic high of PA0 and PA1 which switch on ground to the respective common cathode pins. PA2 and PA3 pin are use to read the inputs S1 or S2 switches. 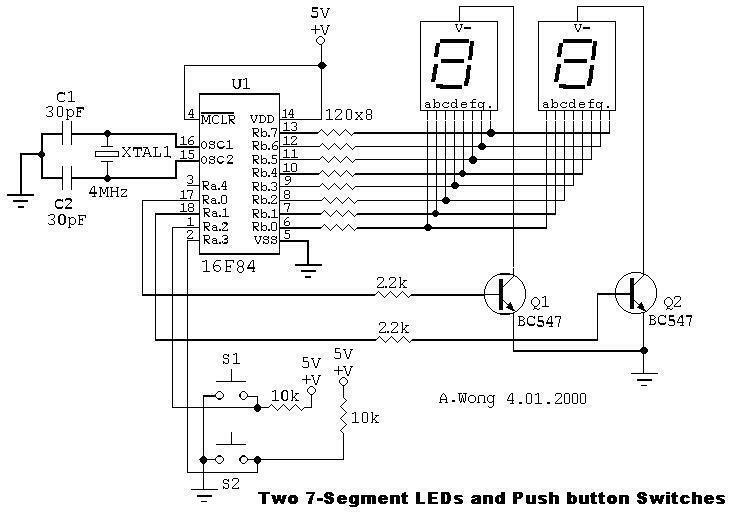 The following code, 7-SEG.C demonstrate how to drive two 7-segment LEDs. The program first display digits on the Left LEDs and counts from 0 to 9 with a delay of 1 second between each digit. Then it switches to the Right LED and repeats the same tasks and then the whole sequence is repeated all over again from the beginning. This is a modification to Asignment 1 where the increment by one is executed only when S1 switch is pressed. When the switch is released, the increment stops. When S2 switch is pressed, it initiate a decrement by one. When count is 99, and S1 is pressed, it becomes 00. When the count is 00, and S1 is pressed, it will becomes 99.